First published in 1862, this sprawling novel is an extravagant historical epic that is teeming with harrowing adventures and unforgettable characters. In the protagonist, Jean Valjean, a quintessential prisoner of conscience who languished for years in prison for stealing bread to feed his starving family, Les Miserables depicts one of the grand themes in literature - that of the hunted man. Woven into the narrative are the prevalent social issues of Hugo's day: injustice, authoritarian rule, social inequality, civic unrest. And this new translation brings astonishing vivacity and depth to Hugo's immortal dramatis personae - the relentless police detective Javert, the saintly bishop Myriel, the tragic prostitute Fantine and her innocent daughter, Cosette, the dashing lover Marius, and many others whom Jean Valjean encounters on his path to sublime sacrifice. Okay, so I've actually been actively avoiding writing this review. I finished Les Misérables back in March, and yet I'm just now writing this blog post. I think I needed time to distance myself from the book and actually write some coherent thoughts on what I read. I have many cousins, but the one I'm closest to (both in age and relationship) lives in another state (insert tears here). Since she also loves to read, we've started reading the same books at the same time and sharing our thoughts via phone call and text. It's like our own book club - but without regular meetings and no guilt if you didn't read or don't like the book. 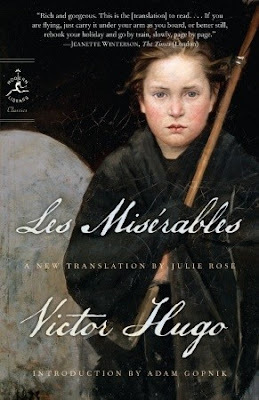 We'd picked recent books for the most part, but we finally decided to tackle one that was on both of our TBRs - Les Misérables by Victor Hugo. We here high off the movie and our big dreams of saying we'd conquered this massive classic! We made a reading schedule - with the chapters/pages we wanted to read per week so that we could finish in a timely manner. And then reality set in. So, let's begin. Exhibit A: The idea to include screenshots of our texts was actually Rachel's suggestion. She knew I was already struggling over how to review this book, and made this genius suggestion. Obviously, you're in for a few laughs when you see what we thought. Listen, just don't judge us. Also, as you can see, I was a bad influence. Rachel was trying to get me to read - and I was protesting! Exhibit B: The push to finally take this book off our TBR? Seeing the movie! While I didn't love everything about the movie, I did like it enough to finally get me to sit down and read this chunker. After this conversation, I made our reading schedule and off we went! Exhibit C: This is the text I reference in the first screenshot - when I said I'd have to start with this. When we began Les Misérables, we were in love. We wrote down quote after quote. We had patience for Hugo's rants and asides. We were giddy with the joy of discovering a new favorite! Who cares that we spent 100 pages talking about a bishop whose role was over after that? We sure didn't! Because it was love. Exhibit D: Our first taste of the frustration that was to come. The words and names were so hard to pronounce! And the footnotes - oh my goodness. While I appreciate all the work that went into translating this book, the footnotes added like an entire book at the end. Struggle. Too much work! So we skipped those suckers, which probably also means like a bazillion references went over my head. Exhibit E: Okay, so this just shows you how ridiculous some of the stuff in this book was. We couldn't help laughing at some of the weird details! For example, poor wronged Fantine? Yeah, just check out the description of the guy that used her. I mean, seriously, what a fella. 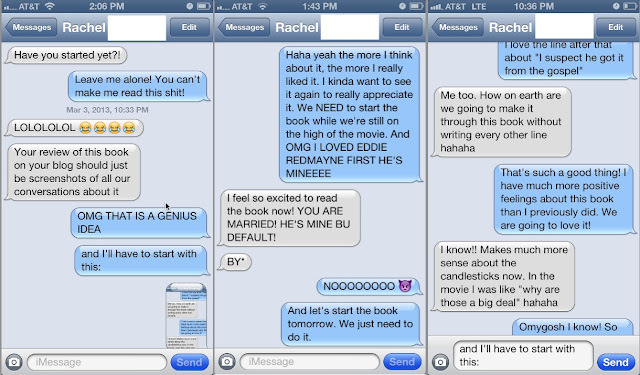 Also, Rachel and I were continually having to ask each other if we'd actually done the reading. Oops! Exhibit F: There is where trouble was really starting to set in. See, I had such love for this book in the beginning. High off the magic of Hugo's writing, we were flying through and loving almost everything we read. And then we started encountering his long, off-topic asides. About Waterloo. The sewer system. The poor. I totally get what he was aiming for (I think) but it was really such a drag to read. I know that trying to read on a schedule meant I was forcing myself to get through it a little faster (instead of just savoring it over a long period of time), but I honestly don't think I would have ever finished this book otherwise. I loved Hugo's writing when he focused on his characters and their actions. I really couldn't put this book down at those times! But, alas, that was like 40% of this book. Tops. Exhibit G: You know what's discouraging? When you're 500 pages into a book and still hoping that it will get better. That it will magically become so entrancing that you just can't put it down. Also, yes, I totally skimmed certain sections. So kill me. Exhibit H: Y'all, I couldn't even motivate myself to read it each week! I got into such a funk that I didn't even want to read anything else either. It's not that I don't understand why this book is a classic. I totally do! And, if you read this blog at all, you know I have some major appreciation for the classics. So, I don't know what happened here. I don't know if it's because I was expecting life-changing epic and didn't realize there'd be so many random rants. Anna Karenina had some similar rants (blergh these old men), but I didn't expect to love the book and then absolutely did. So maybe expectations got the best of me with this one! I just don't know. Also, I was only pretending to blush in embarrassment about only having moved my bookmark. In all honestly, I felt no shame. 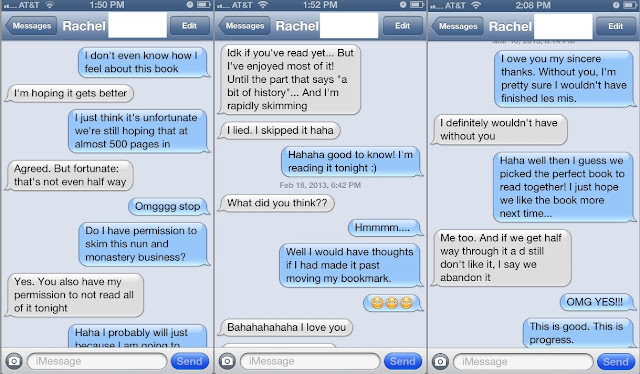 Exhibit I: I can honestly say I would not have gotten through this book if it wasn't for Rachel! Like Asheley recently reading Anna Karenina, there's just something about these challenging classics that require a friend on hand to discuss all the feelings... or all the confusion. 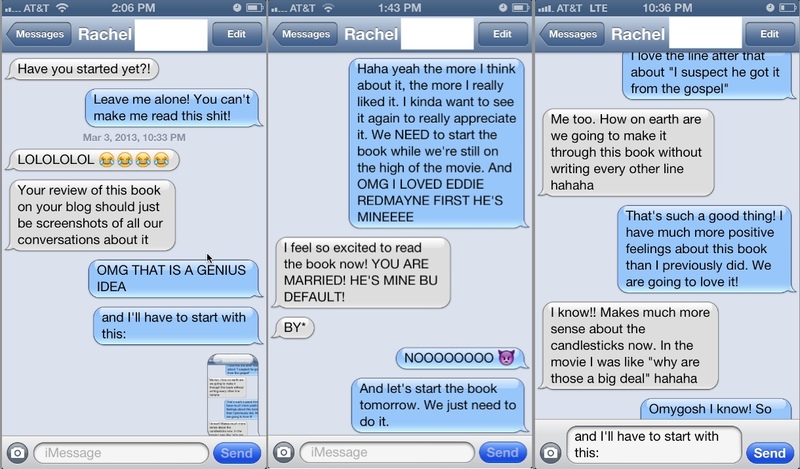 I kindly left out the texts where we debated how we'd rate this on Goodreads. Look, I'll be that person who just didn't love this masterpiece. Doesn't mean I don't think it's deserving of being called a masterpiece - it totally is! I just don't think I'll ever read it again. The story at the heart of this book is powerful - redemption, second chances, forgiveness, first love. All amazing and totally up my alley! But Hugo needed to surrender some control and let an editor help him out. So much of the book felt self-indulgent. Why do I have to read about the Battle of Waterloo (with little to no bearing on the story he's telling) just because he wants to talk about it? Publish a dang essay about the topic and leave it out of this story. For the love. Okay, so I gave it what I call the courtesy classic rating - 3 stars. For Goodreads, that means I liked it. And I did. I also loved some parts (Marius and Cosette, holla!). But I also hated some parts. And that evened out to about a 3 for me. Is it deserving of a 5 for the scope and the writing itself? Sure thing, sugar. But that doesn't mean I enjoyed it on the 5-star level, and I just rate based on my feelings. Also, now that I'm totally proud of myself for having read this beast, I really want to read an abridged version so I can just read the best parts. Like I said, no shame in my game. (Okay, I do really wish I'd loved this one more. Partly because it seems like everyone who has read it does, and partly because I feel like the nitwit that poo poo-ed a literary classic.) So, there's my slightly random review that tells you almost nothing about this story other than the fact that I obviously didn't have the patience for it. "The glance has been so abused in love stories that we have ended up discounting it. Hardly anyone dares now say that two beings fell in love because their eyes met. And yet that is the way you fall in love and it is the only way you fall in love. The rest is simply the rest and comes after. Nothing is more real than those great seismic shocks that two souls give each other in exchanging that spark." 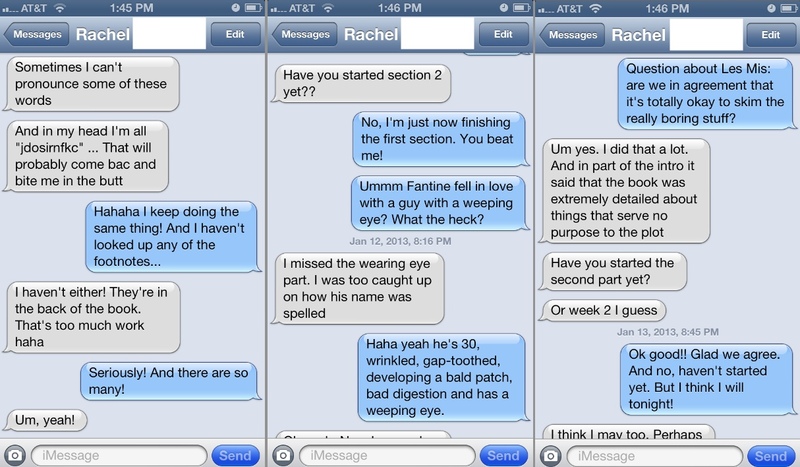 Oh my gosh this is hilarious and probably the best review of Les Mis I've ever seen! I actually bought the Julie Rose translation after seeing the movie too, but apparently got a defective copy since an entire section of Part 2 was missing--like 50ish pages! So I returned it and bought 6 other books with the store credit instead. Win? Haha it's my goal to eventually read this but I don't know if it will happen anytime soon! Such a hard book to trudge through! Oh that's crazy that you got a defective copy! Haha glad you got 6 other books instead! Yeah, it was definitely a hard book to trudge through. Ha I love that your review is mostly comprised of text messages. Humorous and it's just interesting to see how far we've come from the days Victor Hugo lived during, where even being able to communicate through words (not even words through phones) wasn't easy or accessible for all. Les Mis has been on my TBR list for years, ever since I saw a Broadway production of it. It is definitely intimidating, though. I've heard about all of his digressions, though I didn't realize that they take up about 60% of the book. That's ridiculous! I may have to do what you did and find someone to read with me! I may have been exaggerating on the 60% thing but it really did feel that way. It was honestly WAY more digressions than I'd expected. Good for you! I want to read this too but am overwhelmed, and this review confirms why, ha ha! Seriously, does anyone sell an abridged version of this with just the important parts (but a little more than the movie/play)? Loved reading your review. Maybe one day I can be brave too, but I might need to find someone to read it with me when the time comes! Hahah! Yeah, I kinda wish I'd just read an abridged version and called it a day. But yes, find a friend to read it with if you do! So happy you posted this! I've been going back and forth trying to decide whether or not I want to read this for months now. I'm kind of thinking I'll pass since it appears to be a book you just keep hoping gets better and never really does! I'll work on some of the other classics. Yeah, it definitely wasn't the classic for me. I loved a few parts but was mostly UGH to the rest. I would love to read this one, but the size is just so daunting! I also have The Count of Monte Cristo, which is over 1,200 pages .. still haven't picked it up. I just feel like I'd be reading it for the whole year! At any rate, it sounds like a great story. :) Great review! Love the texting! Yeah, books that are this long are so intimidating! I'm legit scared to read this one...It's HUGE. I have heard "meh" from quite a few people who have read it, I basically used Wikipedia after watching the movie, not gonna lie. Congrats to you, quite an accomplishment!! Hahaha yeah MEH describes it perfectly! I am definitely a HUGE WEENIE and have set this aside numerous times because of the length...love your text screenshot review! Also - I reallyreallyreally love the quote you included at the end. I know! I LOVED THAT QUOTE. If only the book had been more stuff like that! I really enjoyed this review, mostly because it's very unconventional. The screenshots of your conversations were really fun to read! I think, should I ever attempt this book, I'm going to need to read it with someone -- I can't imagine being able to get through it otherwise! Yeah, this is definitely a classic that you want to read with a friend if you ever do read it! What's with Hugo and Tolstoy. Ramblers. Bah. Also, seriously, you MUST have another person that can help you get thru books like this. I'd have never made it thru Anna K without the vents, sighs, and general OMGS!!!! and stuff. And I love that you share my love for reading classics/discussing with a friend!